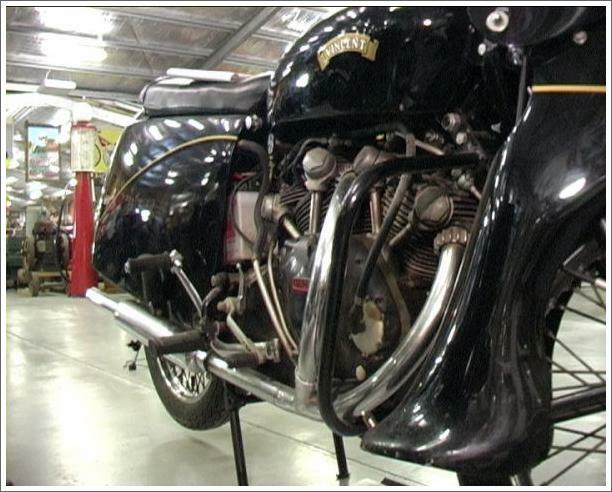 Legend has it that Australian engineer Phil Irving placed a tracing of the Vincent 500 motor on top of a drawing of the same motor in such a manner that it formed a 47 degree V twin. True or not, there was an excellent reason for the chosen angle in that tooling costs for the new motor could be kept to a minimum. Prior to WWII, Phil Vincent bought the rights to the Howard R. Davies company, (founded in 1924? ), and adopted the name Vincent-HRD for his entry into the British motorcycle market. Other than the name, there was little similarity between the HRD and the new model, a J.A.P. powered single released in 1929. The Series A Rapide had many innovations, not least of which was the cantilever rear springing system already proven on the single-cylinder Vincent HRDs. Decades later Yamaha introduced their monoshock system - for all intents and purposes a straight copy of the Vincent system. The Rapide's other features included a stainless steel tank, twin brakes on both wheels, and a duplex primary chain connecting the powerful V twin engine to the Burman four speed gearbox. These machines proved fast and reliable, and sold reasonably well up until the onset of war in 1939. The Series B Rapide was announced in 1945, very shortly after the war's end. The new machine had many refinements and changes including a 50 degree cylinder angle and internal oil galleries. This basic layout was retained for the C and D models, the last of which was built in 1955.